Blue Angel consisted of John Turi, Arthur Neilson, Lee Brovitz, Johnny Morelli and Cyndi Lauper. The band was briefly popular in the New York club scene. They recorded one self-titled album in 1980. 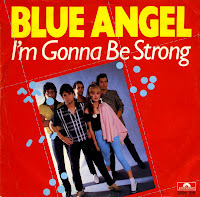 This album included the single 'I'm gonna be strong'. This track was written by Barry Mann and Cynthia Weil. It was originally recorded by Frankie Laine in 1963 and Gene Pitney in 1964. The single did not chart in Europe, but it's still a fine demonstration of Cyndi Lauper's powerful vocals. She would of course go on to have a very successful solo career later on in the Eighties. She re-recorded this song for a compilation album of her solo hits in 1994.